During the 2012 Olympics in London, as visitors sail from Heathrow Airport in electric personal rapid transit (PRT), and look out the window at electric buses using hydrogen fuel cell to run 16 hours daily, they will see thousands of electric cars. London is saving EV and PHEV buyers over $10,000 with new grants, exemptions from congestion fees, and over 1,000 charging stations useable with a low cost annual subscription. The grant will be available to motorists across the UK from 1 January 2011, reducing the cost of eligible cars up to a quarter, up to a maximum of £5,000. London’s citywide electric vehicle charging network, ‘Source London’, will launch in Spring 2011, the Mayor of London, Boris Johnson announced today. Source London, which will deliver 1,300 public charging points across London by 2013, is part of the Mayor’s plans for London to become the electric vehicle capital of Europe. The Source London network will create a single visual identity for electric driving across the capital, and allow members to charge their vehicles at any one of these public charging points for no more than an £100 annual membership fee. Currently electric vehicle drivers have to register in each separate borough they want to use charge points in. In preparation for this new network a website, www.sourcelondon.net, has also been launched providing a ‘one stop shop’ of information on electric vehicles, including charge point locations across the city. 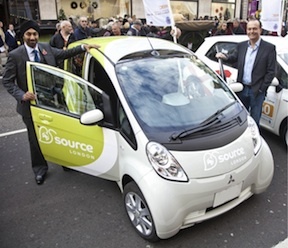 Once Source London has been launched in Spring 2011 drivers will be able to sign up for the scheme online. The development of Source London, has been led by Transport for London in close collaboration with the London boroughs and a wide range of private sector partners – who will play a key part in funding and providing locations for the network’s charge points. Discussions are now taking place with other UK cities developing charge point networks to ensure they can be used seamlessly by electric vehicle drivers and to ensure London’s work can contribute to a national network of charge points. The Mayor has recently reaffirmed a 100 per cent discount from the congestion charge for electric drivers in the capital, as well as other low emission vehicles, which offers electric vehicle owners using the zone a potential saving of more than £2000 a year. Beyond London, other areas are installing charging networks in streets, car parks and commercial retail and leisure facilities. These areas are the Midlands, Greater Manchester, East of England, Scotland and Northern Ireland. Nissan’s CEO, Carlos Ghosn, sited the congestion fee in London and other cities as a reason to invest billions in early electric car leadership starting with the LEAF. The UK has given auto executives greater reason to accelerate EV plans. The UK encourages all of us to prepare for an electric Olympic Games in 2012. Only new cars are eligible (vehicle category ‘M1’). This includes pre-registration conversions (normal, internal combustion engine cars that were converted to battery or hybrid versions by specialist convertors before the car’s first registration). Motorbikes, quadricycles and vans are not covered. Vehicles must give off less than 75 grams of carbon dioxide (CO2) per kilometer driven. Electric vehicles (EVs) must be able to travel a minimum of 70 miles between charges. Plug-in hybrid electric vehicles (PHEVs) must have a minimum electric range of 10 miles. Vehicles must be able reach a speed of 60 miles per hour or more. Vehicles must comply with certain regulations (UN-ECE Reg 100.00) that show that they are electrically safe.